Do you know the worst part of reviewing for the civil service exam? It’s the realization that the same subjects that traumatized you in high school are now coming back to haunt you. I’m talking about math (unless you’re a math genius) and all those logic and analogies nonsense that we don’t normally apply in our daily lives. I assume the exam will be easier for the younger examinees who either excelled in high school or just fresh out of college. The answer, my friend, is strategic preparation. Since you don’t have all the time in the world to dedicate to a month-long intensive civil service exam review, you have to be wise in choosing how to review and what to study in the first place. As they always say, study smarter–not harder. If you remember this by heart, I guarantee that you can pass the civil service exam in one take and become one step closer towards landing your dream government position. In this definitive no-nonsense guide, I will let you take a glimpse of the processes and study hacks that can help you pass the Philippine civil service exam in one try. What is the passing rate for the civil service exam? 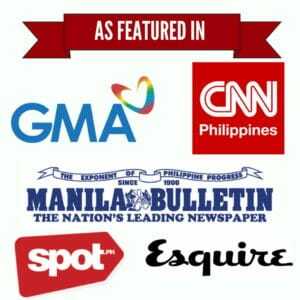 What is the scope of the civil service exam? How to pass the civil service exam in one take: Practical tips before, during, and after the examination. a. Take a diagnostic exam. b. Create a realistic review plan–and stick with it. c. Improve your focus with Pomodoro technique. g. Sharpen your time management skills with practice tests. c. Never leave any item unanswered. d. Save the most difficult questions for last. 1. What is a civil service exam? 2. Who can take the civil service exam? 3. Who are exempted from the civil service exam? 4. What are the civil service exam schedules? 5. What are the civil service exam requirements? 6. How can I apply for the civil service exam? 7. How can I take the civil service exam? 8. How long does it take to get the civil service exam result? 9. What happens next after passing the civil service exam? In order to get civil service eligibility, examinees must obtain a passing score of 80.00 or above. As mentioned in our ultimate civil service exam guide, there are two levels of the exam that you can choose from: sub-professional and professional. 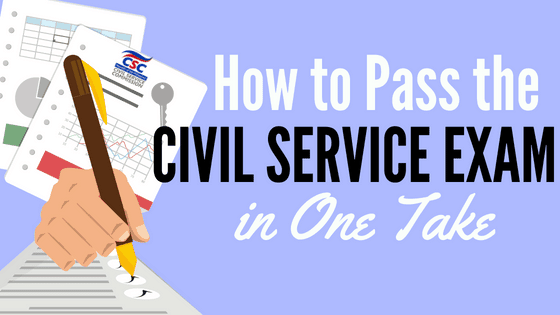 If you take and pass the sub-professional civil service exam, you’ll be qualified for first-level government positions (think clerical jobs). Meanwhile, if you choose to take the professional civil service exam (as most of us do), you’ll be qualified for both first-level and second-level positions that require a bachelor’s degree. Apparently, the professional-level exam is relatively more difficult than the sub-professional. The former also has more items and longer time allotment than the latter. 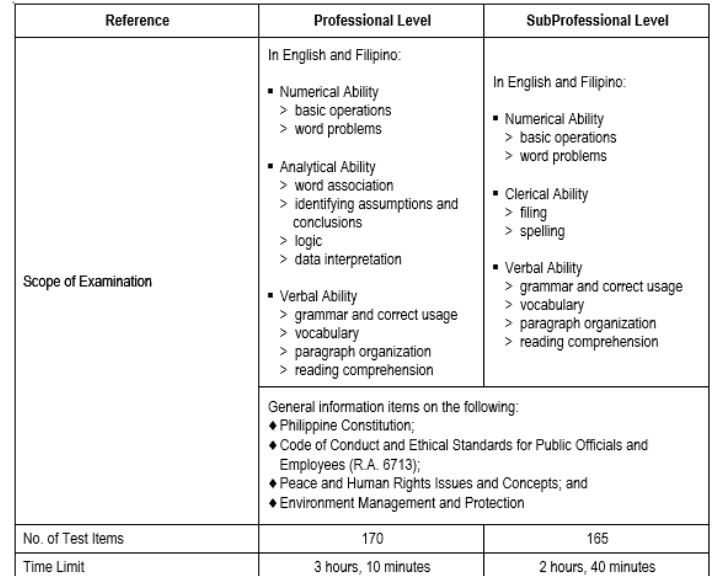 As you can see, both exams have questions about Verbal Ability, Numerical Ability, and General Information written in either English or Filipino. The main difference is that the Sub-professional exam has questions on Clerical Ability (30-40 items) which test the examinee’s knowledge about basic tasks like filing, alphabetizing, etc. The professional civil service exam, on the other hand, has items that test one’s Analytical Ability. These are questions (30-40 items) about logic, data interpretation, word association, single- or double-word analogy, etc. In addition to these, both exams also include 20 Personal Information Questions which are usually asked at the beginning. Civil service exam can give you the jitters. And it doesn’t just happen during the exam itself. More often than not, it can get to your nerves even while you’re preparing for it and later as you anxiously wait for the results. To help you overcome nervousness and build up the confidence you need, I’ve listed down all the essential tips that ensure success before, during, and after the exam. When reviewing for the civil service exam, you have to spend more time improving on your weakest areas. An accurate way to find the areas where you struggle with the most is through taking a diagnostic exam. At the start of your review, try to test your stock knowledge by answering simulated exams. There are free questionnaires you can download online. Or, you can buy one of the many civil service exam reviewers sold in bookstores. Take note which areas where you scored poorly. This way, you can dedicate more study time to these subjects and maximize the limited time you have for review. Unlike licensure board exams, you don’t have to spend months and endless hours every day just to review for the civil service exam. A few hours every day for the whole month prior to the examination date is enough. The key here is time management and creating a study plan based on your body clock and current lifestyle. Set aside 1 week for each subject area: Week 1 for Numerical Ability, Week 2 for Verbal Ability, and so forth. If you’re currently a student or an employee, schedule your review in the morning or at night whenever your alertness is at its peak. An hour or two of review daily should be sufficient as long as you focus and don’t let procrastination or distraction get in the way. This is what experts call “spaced repetitions,” as opposed to cramming sessions during which you squeeze as much information as you can to your mind in one day only to forget most of them come examination time. With the allure of social media and mindless entertainment, it’s quite easy to keep your mind off your review materials. Sometimes all it takes is common sense to kick distractions. Turn off your phone. Stay away from social media. Install website blockers on your web browser. But to push your ability to focus even further, what you need is a scientifically proven strategy. If you’ve never heard of Pomodoro technique, the principle is quite simple: Set your timer for 25 minutes and use this time to give whatever you’re reviewing your full, undivided attention. A 5-minute break follows afterward. One Pomodoro is equivalent to 25 minutes of work plus a 5-minute break. Once you complete 4 Pomodoros, you can take a longer break (20-30 minutes) before starting a new round. Regular breaks allow your brain to assimilate all the new information, give you chance to blow off some steam, and in the process make you less vulnerable to distractions. The questions and answers in civil service exam reviewers are not the same ones that appear in the actual exam. In fact, the Civil Service Commission doesn’t endorse any reviewer or review center, some of which promises the moon just to convince you to give them your hard-earned money. To their credit, these reviewers can help you familiarize with the basic concepts and train you on how to answer questions. 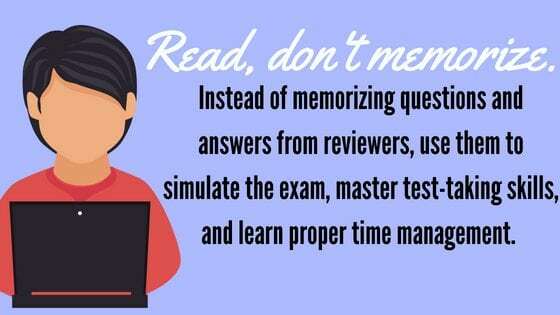 So instead of memorizing questions and answers from these reviewers, use them to simulate the exam, master smart test-taking skills, and learn how to properly manage your time. What you eat matters just as much as what you review for the civil service exam. If you nourish your brain, it can help you process more information and prevent anxiety from sabotaging your concentration. Research shows that foods rich in omega-3 fatty acids like nuts, olive oil, and fish can boost your brain prior to an exam. In addition to that, a study published in the journal Nutritional Neuroscience found a diet rich in both omega-3 and omega-6 fatty acids reduces anxiety which can derail your chances of passing an exam. Memories are strengthened every time we go to sleep. The less sleep you get, the less efficient your brain becomes in processing and storing information. In fact, research shows that if you haven’t slept, your ability to learn new stuff decreases by up to 40%. And if you don’t get enough sleep the night before an exam, your ability to focus can be likened to that of someone who drank alcohol. Do yourself some favor and sleep for at least 7 to 9 hours in the nights leading up to the exam. And if you’re ever thinking of pulling an all-nighter, don’t dare do it on the night just before the big day. The stress and poor concentration due to sleep deprivation will put all your efforts down the drain. Due to a phenomenon called “testing effect,” we naturally learn more by taking exams than simply reading notes. Perhaps it has something to do with knowledge application: the more we test ourselves, the more likely the information is reinforced to our memories. It describes how after spending some time studying, people tend to be overconfident. But when it’s time to take the exam, the same people who overestimate their skills struggle to remember the things they’ve studied. Most importantly, answering practice tests can help improve your time-management and quick-thinking skills. Remember, civil service exam is a time-pressured exam. It doesn’t matter how knowledgeable you are; if you don’t answer as many questions as you can within the allotted time, the chances of you passing the exam become slimmer. So how can you hone your time management skills? Answer: By taking simulated exams, learning how to read fast, and practicing over and over again. It’s also important to schedule your practice tests for maximum retention. For example, after a week of studying math concepts, take timed practice exams so you can apply what you’ve learned. Do the same for other subjects. Then, you can take more practice tests throughout the week before the examination to further cement all the stuff you learned into your memory. Math: Learn how to quickly solve math equations/problems. Since no calculator is allowed, practice basic manual calculations. Reading Comprehension: Don’t spend too much time reading the whole article. Go straight to the question and then let it guide you toward the exact part of the article containing the answer. General Information: Familiarize yourself with current events and the Philippine Constitution (see the scope of examination above). Logic: Determine how you came up with the answer to every logic question you encounter in practice tests. When it comes to this area, the system you use in answering the questions (i.e., your core analytical skill) matters more than the nature of the questions themselves. By this time, I assume you already visited the test venue a day or two before the examination. This is done so you can familiarize yourself with the location, prepare for any possible traffic or other inconveniences, and ensure that you’ll get to the venue on time. Once you arrive, you’ll go through a verification process and also spend some time looking for your room assignment. To avoid triggering test anxiety, I suggest coming to the exam venue at least an hour before your scheduled exam. This enables you to get into the groove and calm your nerves before taking the test. The time pressure can cause even the most well-prepared to crumble and fail. Don’t let this happen to you. You can’t change the fact that you’re under time pressure, but you can choose whether to let this mess up with your concentration or not. Whether it’s a prayer, deep breathing, or positive self-talk, do anything that can help you relax. There’s nothing worse than spending weeks to prepare for the civil service exam only to throw it all away because of an anxiety-induced mental block. Remember that civil service exam is just that–an exam. Don’t take it as if your whole life depends on it. The civil service exam is a multiple choice exam. Therefore, even if it’s a wild guess, the fact that you provide an answer gives you a 25% chance of getting it right. In contrast, if you leave any item blank, your chance of having a correct answer comes down to zero. Also, the civil service exam doesn’t deduct points for every wrong answer. So never leave an item blank even if it means randomly shading answers up to the last minute. As a whole, civil service exam is relatively easier compared to UPCAT or similar exams. However, to answer all the questions correctly, you need time. And there’s the rub: Most people fail because time is just not enough. That’s why it’s important to take practice tests. I recommend it not because civil service exam reviewers have the same questions as the actual exam (they don’t) but because simulated exams can help you learn how to manage your time well. To ensure you give every item equal attention, answer the easier ones first. For example, if you’re not good in Math, focus on the English grammar questions first. 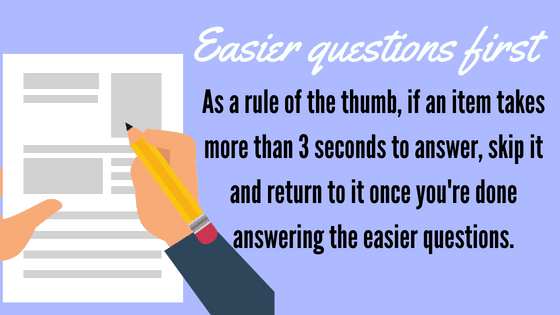 As a rule of the thumb, if an item takes more than 3 seconds to answer, skip it and return to it once you’re done answering the easier questions. Waiting for the results can also cause a lot of anxiety. A few days or weeks after the exam, you might start second-guessing yourself. You begin thinking that maybe your preparation and the way you answered the exam weren’t enough. You already took the exam. The only thing left for you to do is pray for the best. Don’t let the doubts, fears, and uncertainties cripple you. Believe that you will pass the exam and you will. In case you don’t, just tell yourself it’s not the end of the world. If you really want to work in the government, then there’s nothing–even your failed rating–can stop you from achieving it. Learn from your mistakes, determine what your weakest areas are, and dedicate more time to the review. Failure is a sign that you’re either up for something better or your preparation efforts need an upgrade. thank you! guys, lets claim it! we will all pass the exam this coming March. 🤗 good luck and god bless to all! First time to take the exam…so i just hope and pray makapasa..thanks sa tips..very useful to me..
tnx for the tips.. i hope and i pray na mkapasa ako ngayung march na exam.. help me lord.. I will take the exam this coming March. Thanks for the tips. Hope I can do it and pass the test. Many times took the exam but to no avail yet still trying this march and hope to pass. i love the tips! thank you so much! i really did pass the exam! The advises and technique is very helpful, I do hope that this tip could help me a lot in taking the civil service exam this coming September.